I know a lot of people who accuse me of entertaining on weeknights as a way of flaunting my self-employed status. Of COURSE I can have people over on a school night, I have all day to shop and prep and get the house ready, unlike NORMAL people who have to work all day and cannot conceive of getting home and starting to get ready for a party. But to those who doubt me, I say NAY! For I spent the first fifteen years of my career working long days offsite just like you, and yet, I found that weeknight fun with guests actually perked me up, instead of being a drag. It feels a little bit decadent to have people over mid-week, like a tiny little piece of weekend. I promise, with a few little tips and tricks, you won’t hesitate to call your gang and invite them over some random Tuesday or Wednesday. Staples: Having some basic supplies that you always keep on hand can take a lot of pressure off of having guests on a weeknight. This is especially important in the area of pre-dinner nibbles. At an after-work gathering, there should be less time spent over cocktails and snacks, in favor of sitting down to dinner. It may be a social event, but people are less likely to overindulge in booze (more on that in a minute), and less likely to stay longer than you would prefer if you get to the main event sooner rather than later. Towards that end, I keep things like pretzels, chips, mixed nuts and olives in my arsenal for quick snacks. Want to go even more basic? Try popcorn. 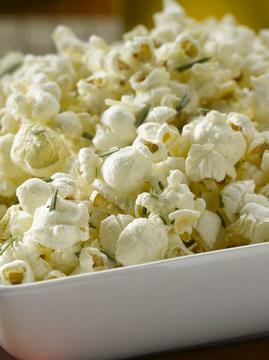 Freshly popped popcorn, tossed with salt or parmesan cheese, drizzled with truffle oil or given a shake of an herb mixture can take as little as 6 minutes and is an ideal snack, not overly filling and not expensive! My favorite recipe is below. Paper or Plastic? : The company is the most important thing, so don’t be afraid to serve good food on disposable dinnerware, especially if you don’t have a dishwasher. No one wants to say goodnight to guests at ten, and still be up at midnight washing dishes, or worse, facing them in the morning before your coffee. Want some awesome stuff to keep on hand? 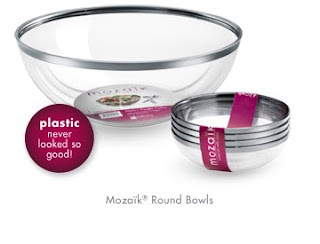 Try Mozaik. 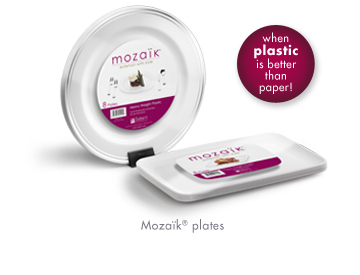 They have very cool plastic plates, flatware, and serving stuff…disposable never looked like this! But they are sturdy enough to reuse if you decide to give them a second life, you can even put the plates in the top rack of the dishwasher. 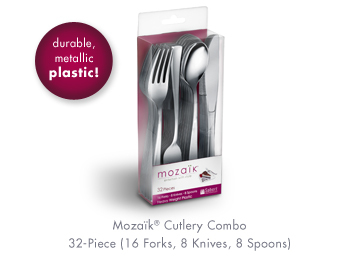 The flatware is tough and stands up to almost anything you are likely to serve, the plates are solid, and the servingware is contemporary and stylish. And which is best, you can get it in bulk , making it very affordable. Mangia! When in doubt, think pasta. Nothing is easier or quicker to get on the table than pasta, and nothing is more satisfying at the end of a long day than a bowlful of steaming strands. If you buy the fresh stuff, it cooks in less than 2 minutes, but keep a box or two of angel hair in the pantry which is 3 or 4 minutes from pot to plate. Sauce can be as simple as a jar of decent marinara…the one I use is Rao’s, but Lidia’s, Fanny’s and Bertucci are all good options, buy a few and do a taste test. Feeling guilty about sauce from a jar? Be sure to perk it up with really top quality parmagiano reggiano, freshly grated, and some fresh basil leaves torn roughly on top. You can mix in some chunks of fresh mozzarella or crumbled goat cheese for a richer dish. Want a heartier sauce? Saute some mild Italian sausage meat out of the casing, drain the extra fat and stir it in. Not a red sauce fan? Splurge on a small package of truffle butter or a bottle of truffle oil, and stir that in with some chopped chives and shredded meat from a rotisserie chicken. Can’t find truffle butter or oil, or it falls outside the budget? Use a fruity olive oil and lemon zest instead. Have slightly more time to cook? Check out this post on or pasta with chicken and zucchini, light and delicious. All pasta needs to round itself out is a loaf of good bread and a simple salad, and one of my personal go-to dinner party classic salads is below, an unexpected mix of celery, green apple and parmesan, it is fresh and crunchy and very easy to make. But feel free to buy a bag of pre-washed greens of your choice, and a good quality bottled dressing, the Newman’s Own are always a crowd pleaser. School night sweets: If my family had a crest, the motto would be “Dulcis usquequaque!” which is “There is always room in the dessert compartment!”. And no, I am not remotely suggesting you bake on a Tuesday, unless you love to do it and the party is on Wednesday. You can always let one of your guests bring dessert to take the burden off you, or you can go with a classic stand-by, a freezer full of ice cream or sorbet! Basic, classic vanilla is easily topped with some fresh berries or a drizzle of a sweet liqueur to gussy it up…Kahlua, Chambord, Frangelico and bourbon are all great toppers. Want more of a show stopper? Try the recipe for Red Wine Caramel sauce below, it is a fantastic way of using up an open bottle. In Vino Veritas: Speaking of wine, it is a weeknight, so no one is looking to party till the wee hours or have to head into the office hungover the next day. Stick with wine or beer, and be sure to offer sparkling water or other non-alcoholic beverages. I find that if there are bottles of cold water on the table in easy reach, my guests will help themselves and drink less. I killed two birds with one stone by buying a case of French Sparkling Lemonade in glass bottles with the cool flip tops. That way I could offer it as a non-alcoholic option, and also save the bottles which I cleaned, removed the labels, and use and re-use for cold water. I just fill up about 4-6 and stash them in the bottom of the fridge and then pop them on the table, about one for every two people. I keep mine in a lovely old wooden wine crate that was a gift from Charming Suitor. No luck like potluck! Want to have your gang over, but afraid that their elevated tastes will be let down by jarred sauce pasta and store bought ice cream? Toss the challenge back at them. Assign dishes to guests, those who can cook, will, those who can’t can buy the same bakery breads and desserts you would, but taking one more errand off your plate. No day like today: Weeknights are great for socializing with that couple who keeps trying to make weekend plans, but your calendar is always booked. Weeknights are perfect for meeting your significant other’s friends for the first time, less pressure and shorter time to have to be on your most impressive behavior! Or a perfect night to get the girls (or guys) together without losing date night. Toss celery and apple with lemon juice and olive oil and season to taste with salt and pepper. Arrange cheese on top. In a medium saucepan, bring the sugar and water to a boil over medium high heat. Cook without stirring until a pale-amber caramel forms, about 5-6 minutes. Remove from the heat and carefully add the red wine. Place back over heat and cook, stirring to dissolve the hardened caramel, until it is slightly reduced, about 3 minutes. Transfer to a serving bowl or pitcher and serve warm. Don't forget to make a comment to win! I love entertaining on "school nights"! My CS and I often have a gathering mid-week, to get over the hump. The best night we had was win we asked everyone to bring a pizza of there choice. All being foodies, no bought a pizza, rather made them and to my surprise (not really! LOL) there wasn't a single pepperoni pizza in the house. Because oven space was an issue, CS heated some up on the grill, although most of us ate the pizza at room temp. *No salt is needed due to the saltiness of chorizo. In a skillet, crumble and cook chorizo. Drain and set aside. In a saucepan, mix both cheeses and about 1/4 cup of milk. Stir over low/medium until melted. More milk may need to be added if mixture is too stiff. Add in chorizo. Pull off heat and set aside. ***Author's Note - The amount of the Queso Fundido you make is up to you. I tend to make to much so that I can use it later in the for burritos or dipping tortillas. Unroll pizza crust on sheet pan. Stretch to fit, sprinkle with corn meal and flip over so that corn meal side is on the pan. Pinch sides so there is a edge. Prick the dough so it doesn't puff too much and bake according to package instructions. Once out of the oven, rub entire crust with cracked garlic. Let cool slightly. 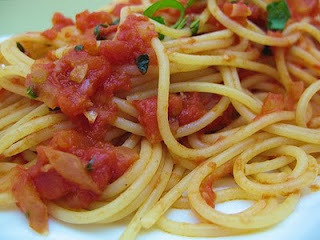 Add sliced tomatos on top (I don't overlap). Sprinkle with fresh cracked pepper. Spoon on Queso Fundido mixture on each tomato. Mixture will spread when heated. Rub the edges of the crust with a little olive oil. Bake at 350 until cheese is golden. While it's not all that fancy, I have had plenty of weeknight fun hosting "bring-n-build your own" nights at my house. Whether it's burgers, hot dogs, tacos, whatever... I supply the main dish (normally the meat) and the staples, and have others bring the toppings of their choice, plus extra to share. 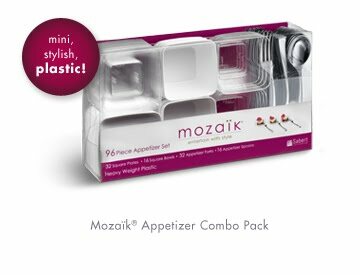 This is a great way to try different flavor combinations that you might not normally try, and it saves me plenty of time on prep because the guests put together their own food! It has been a big hit and we have repeated the tradition almost every month. And thank you for the Mozaik links – I will definitely be purchasing one of those appetizer sets! Making Pizza with friends is my standard weeknight choice. Most restaurants carry packages that contain 2 Pizza shells with sauce. All I need to do is provide mushrooms, peppers, cheese & a few meats. Often this is a great leftover user; leftover deli meat, unused chicken, the bacon we didn't finish at breakfast, etc. Made as a group & cooked in 15 minutes! I love Mozaik. Being Canadian I have only seen there cutlery & am feeling very excited they have more! What a time saver! I am visiting my mom at the moment and we are having a dinner tomorrow night AND making your awesome Chicken Zucchini Pasta--which I have already made twice since you posted the recipe. Yum. When I have any weeknight get-togethers, i love anything i can make in a crockpot. super easy and clean up is a breeze if i remember to put in a liner. Thanks for the great column and excellent easy-to-use advice. Just a note about the popcorn -- there's no need to do it on the stovetop or to add oil if you have a microwave and a brown paper bag (yep, just the ones you used to take your lunch to school in). You take regular popcorn kernels, put them in the paper bag, fold the top over, place it in the microwave, and push the popcorn button. Let it go until the popping slows to about 2-3 seconds between pops. This way, you get plain, healthy, economical popcorn without any oil or the chemicals they put on store-bought microwave popcorn and you can control what you put on it. So hungry right now, yum. I had a bread & butter party. I had guest bring either homemade breads or store-bought breads and compound or imported butters. It was inexpensive, different & fun!